Posted on 12, July 2016 by EuropaWire PR Editors | This entry was posted in Art & Culture, Education, United Kingdom and tagged artist, exhibition, John Duncan, Matthew Jarron, University of Dundee. Bookmark the permalink. Dundee, Scotland, UK, 12-Jul-2016 — /EuropaWire/ — An exhibition celebrating the 150th anniversary of the birth of John Duncan, one of Scotland’s most internationally renowned artists, has gone on display at the University of Dundee. The exhibition features two of Duncan’s classic Celtic-inspired paintings as well as rarely seen archival material, including details of his teaching in Dundee, publications that Duncan illustrated and correspondence with a later Dundee painter, James Torrington Bell. 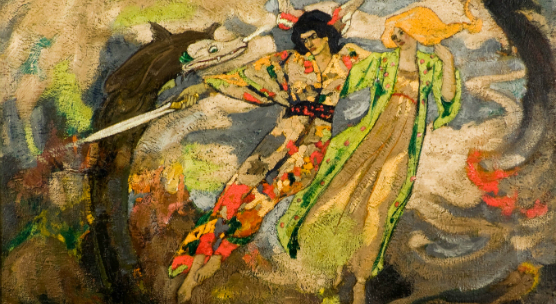 Acclaimed as a leading figure in the Celtic revival and symbolist movements and born in the Hilltown area of Dundee, John Duncan’s work will be on display until the end of the month. Curator Matthew Jarron explained, “Duncan’s Celtic Revival work in Edinburgh is well known but he also spearheaded the movement in Dundee, gathering around him a group of young decorative artists to form what was effectively the city’s first design collective. The display can be seen in the entrance of the Matthew Building, Duncan of Jordanstone College of Art & Design. Curator Matthew Jarron also undertook detailed research on Duncan’s time in Dundee forhis recent book on Art in Dundee 1867-1924 which can be purchased at online. Admission is free and John Duncan’s work can be viewed between 8am-8pm (weekdays) until Thursday, 28th July. For further information, email museum@dundee.ac.uk or call 01382 384310.